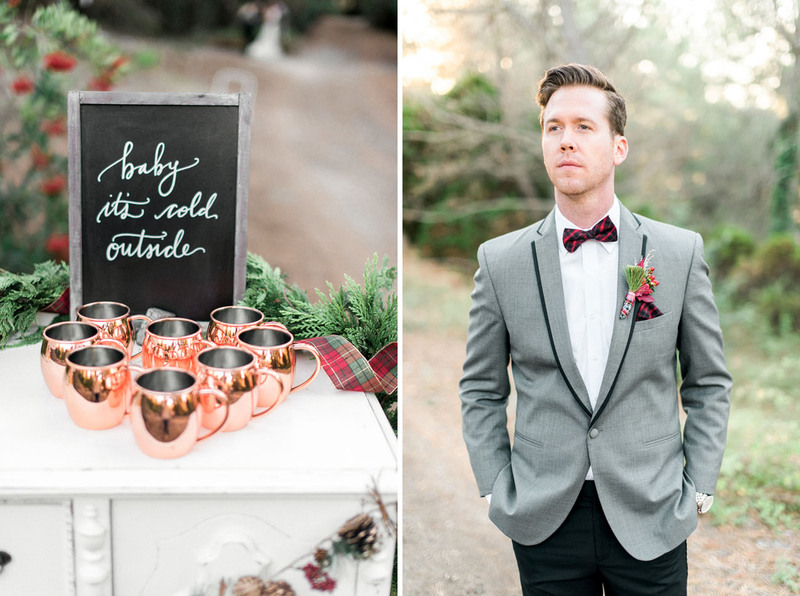 Inspired by the winter season, today’s holiday wedding editorial features plaid accents and a bit of edge! 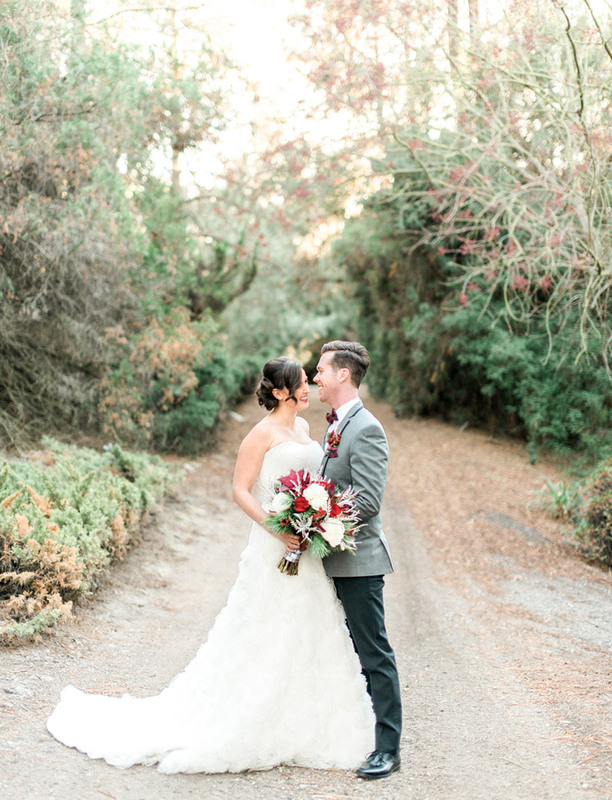 The pine woods at South Coast Botanic Garden made for the perfect backdrop as the couple danced around and frolicked in the greenery. 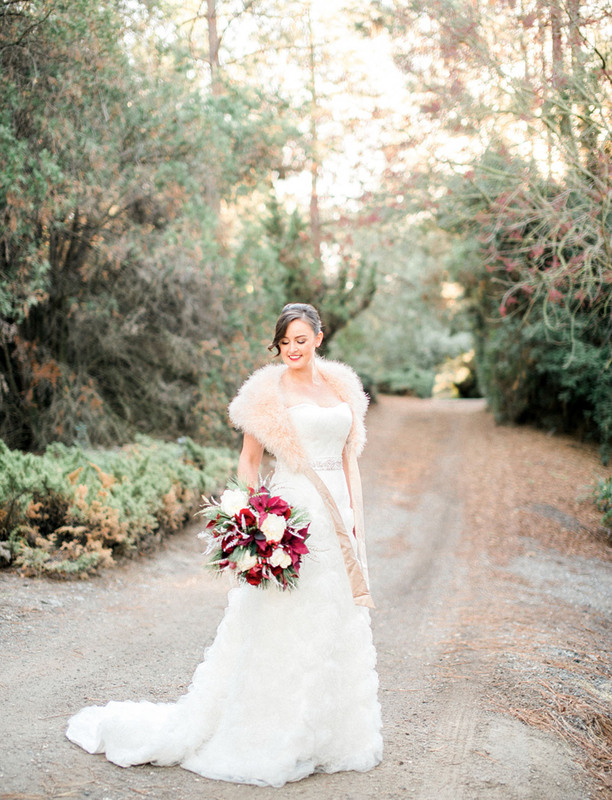 The bride donned a flowing ruffled gown, along with a fun feather bolero, and a vibrant red lip — making her look like a modern-day version of Snow White. 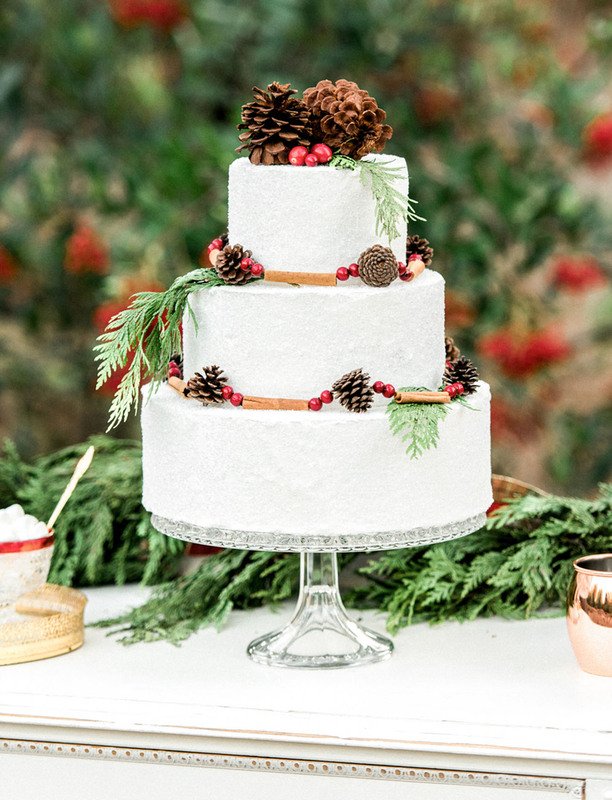 Event designer JenEvents shares We wanted to capture the snowy winter season, but also the warmth that comes with it. 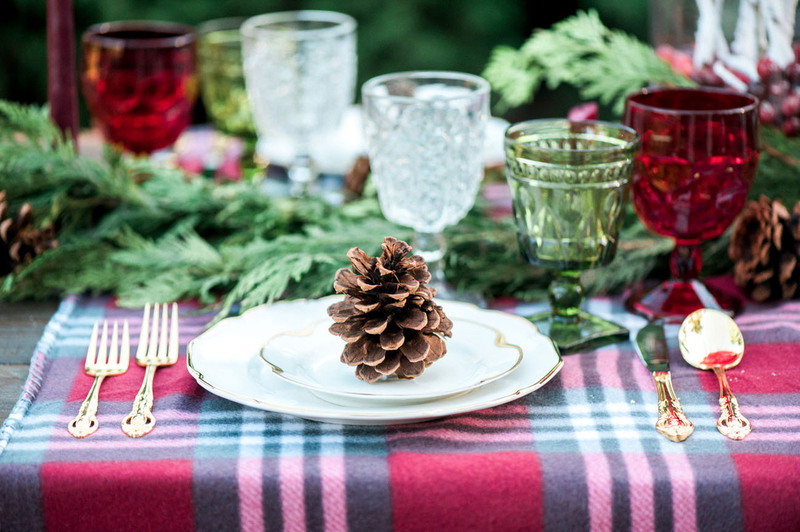 So we incorporated cozy plaid + flannel accents, along with rich colors in the bouquet and on the tablescape! 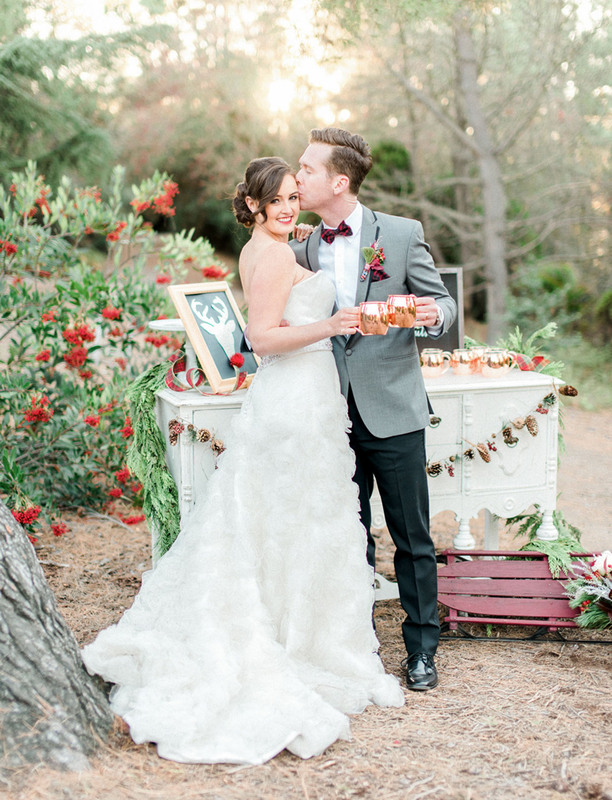 Let’s head to the woods and see all the gorgeous imagery by Christine Skari Photography! 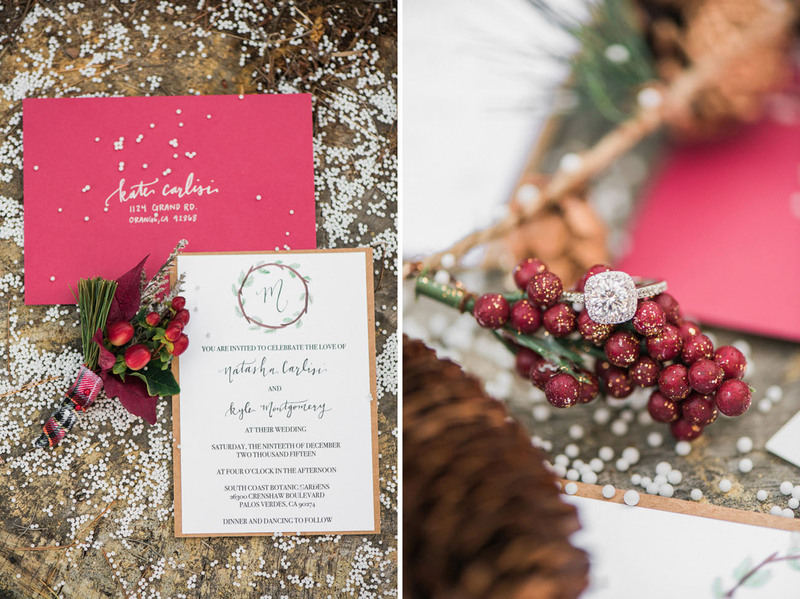 Pirouette Paper created a simple, but elegant invitation suite that included a ruby red envelope and a monogrammed wreath. 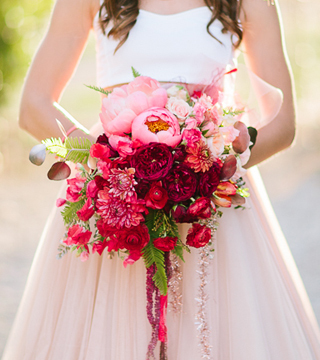 The bride’s stunning Justin Alexander gown is from Adina’s Bridal. 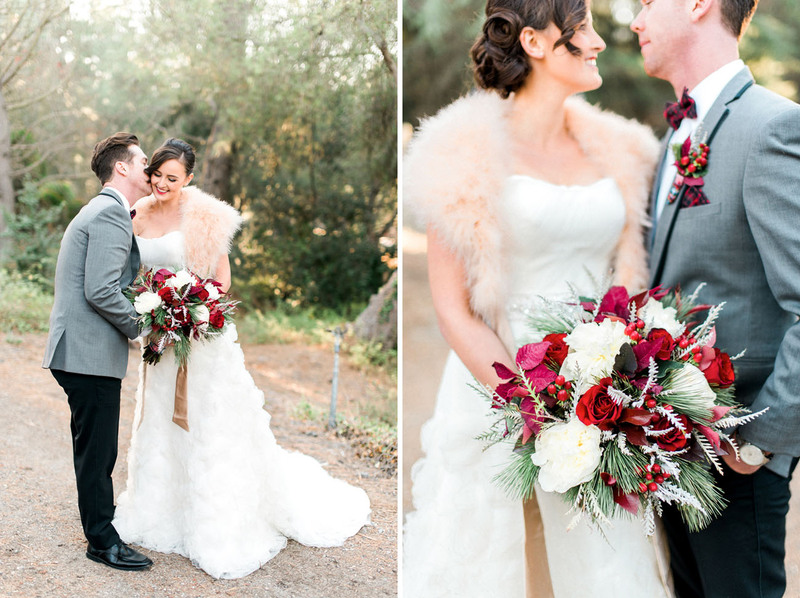 Kat’s Creations Floral Design created an bountiful bouquet, brimming with red coffee berries, white peonies, burgundy poinsettias, frosted grevillea, pine, and red roses all tied together with plaid. 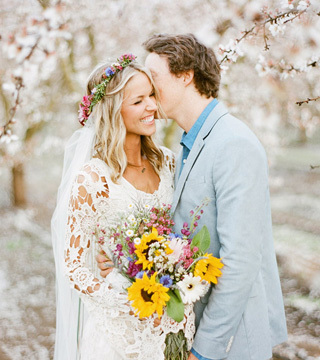 The bride’s gorgeous hair + makeup is by Genesis Imagery. 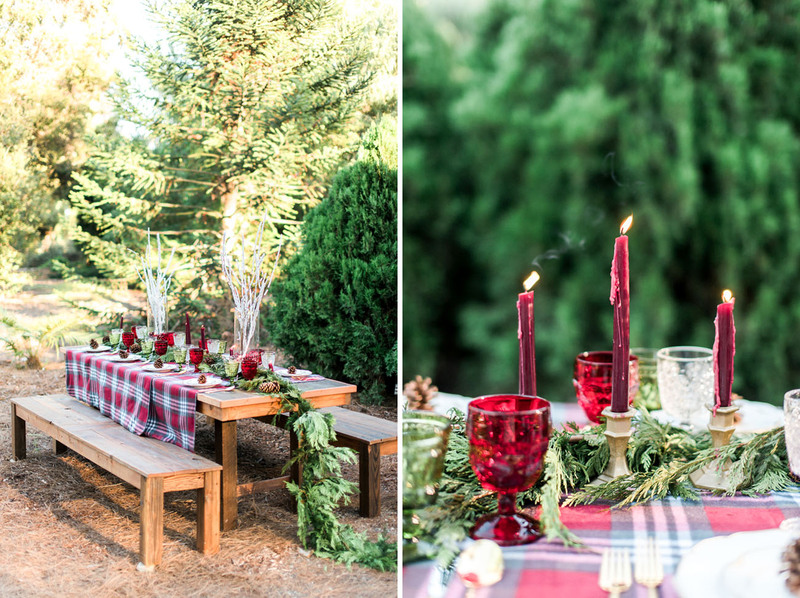 The farm table and benches from Party Pieces by Perry fit perfectly in the woodsy setting! The tablescape was completed with gold-rimmed China plates, vintage candlesticks from France and ornate gold flatware from Cherished Rentals. 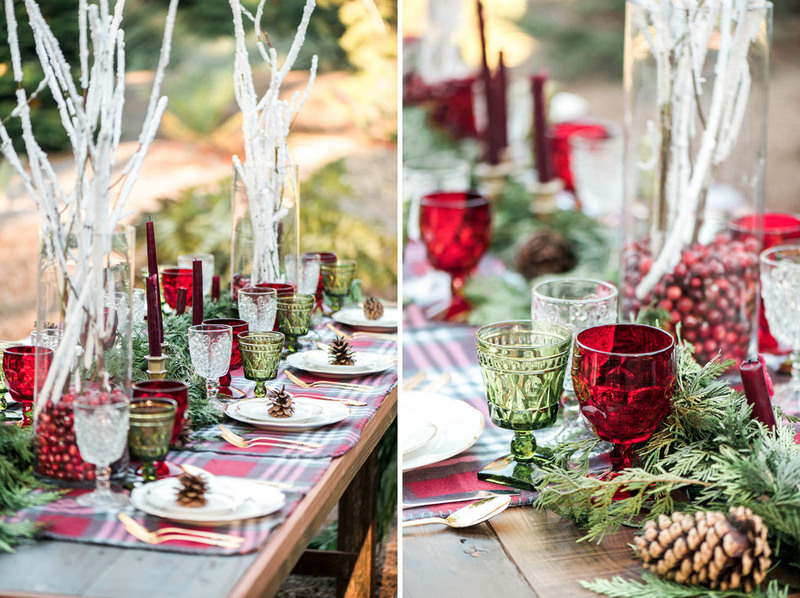 The pressed glassware in ruby red + olive green is absolutely divine!! 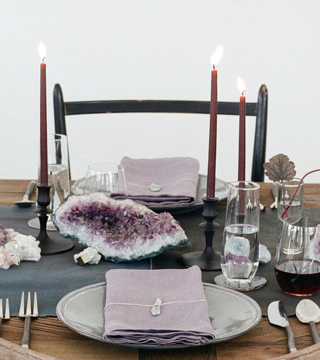 Such a perfect tablescape for a holiday wedding or party! 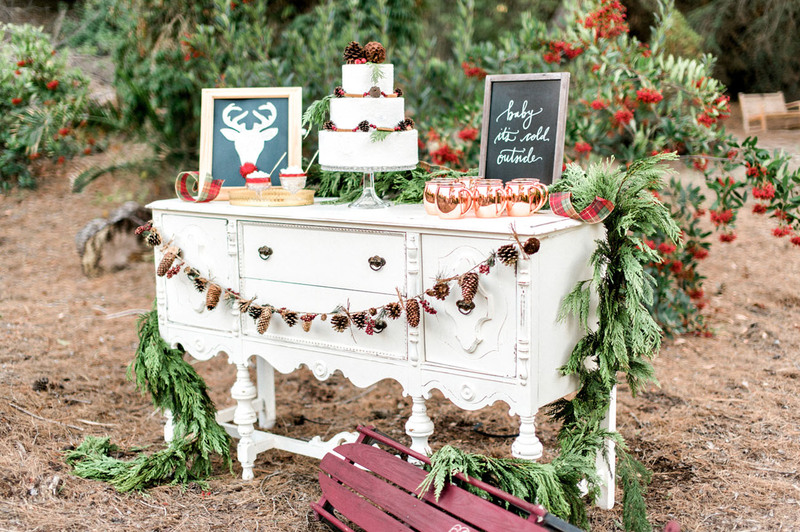 We love the pinecone garland + pine greenery that wraps around the white dresser from Party Pieces by Perry. What’s going in the mugs? Hot chocolate, of course!! 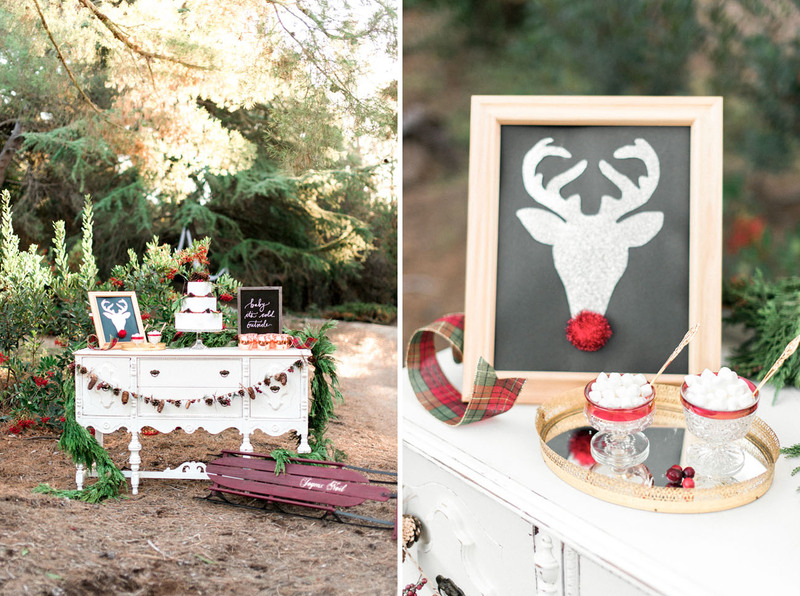 Calligrapher Pirouette Paper created the sweet “Baby, It’s Cold Outside” sign + the reindeer silhouette for the table. The groom looks so dapper in his tuxedo from Friar Tux. 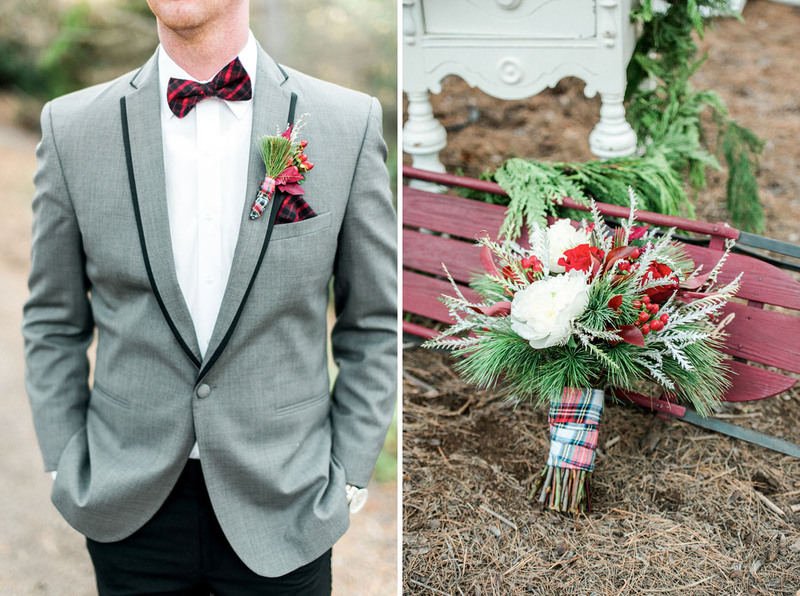 How darling is that boutonnière constructed from a piece of a poinsettia and fragments of the bouquet? 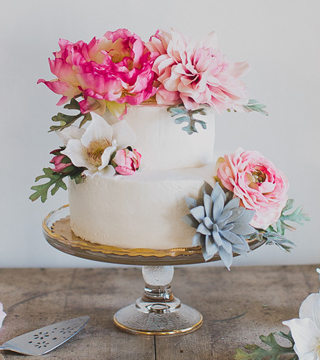 The addition of the “freshly fallen snow” on the three-tier cake from LoveCakes is so sweet!! Such a wintry wonderland, right? Thank you to the dream team behind this shoot! 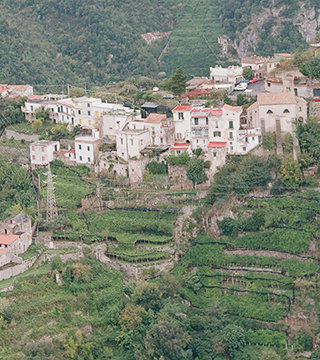 Thank you for the feature, Green Wedding Shoes!